The ever so addicting Paleo Pork Egg Roll in a Bowl (Crack Slaw). Super easy to make, and oh so satisfying. 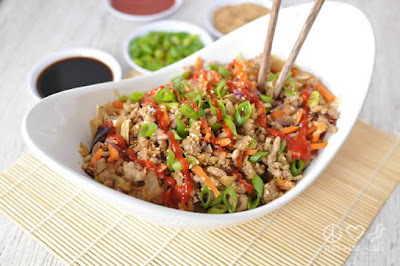 Low Carb Pork Egg roll in a bowl (Crack Slaw) as it is affectionately called, is a staple in many low carb, keto and paleo diets. Quick and easy to prepare and packed with flavor. On the table in under 30 minutes. You can’t beat that! It also reheats well, making it the perfect dish for easy low carb meal prep. There are so many variations of low carb egg roll in a bowl recipes floating around the interwebs. It is right up there with fathead pizza recipe variations. Everyone has their own version of keto crack slaw and everyone loves it! If you are not a fan of ground pork, feel free to use ground chicken, turkey or even beef. If you have some leftover vegetables, toss those in there also. You really can’t go wrong. I also like to make this egg roll in a bowl recipe for breakfast and top it with eggs. Delicious! Do you have a favorite egg roll in a bowl variation? I’d love to hear about it. If you are not concerned with keeping this paleo, feel free to substitute soy sauce for the coconut aminos. You can also use tamari. Heat sesame oil in a large skillet over medium high heat. Add the garlic, onion, and white portion of the green onions. Sauté until the onions are translucent and the garlic is fragrant. Add the ground pork, ground ginger, sea salt, black pepper and Sriracha. Sauté until the pork is cooked through. Add the coleslaw mix, coconut aminos, and rice wine vinegar. Sauté until the coleslaw is tender. Top with green onions and sesame seeds before serving. 0 Response to "LOW CARB PORK EGG ROLL IN A BOWL (CRACK SLAW)"